This OmniGraffle stencil provides tons of elements for creating visual website flowcharts and site maps. This is the OmniGraffle version. Just drag-n-drop and rename pages from our OmniGraffle flowchart stencil to create professional deliverables for your clients, developers or team members. 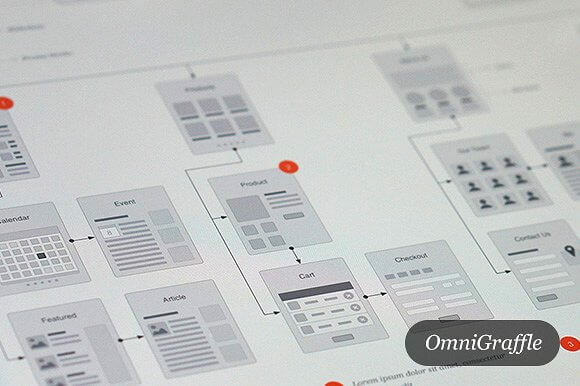 The flowchart template comes packaged with 63 mini wireframes to represent common page layouts, built on a 4-column grid with elements rounded to 5 pixels, allowing for easy editing and grid snapping. Flowcharts not only demonstrate the pages and interactions, but also show a general idea of the content and layout of each page. Along with the wireframes, you get all the lines and labels to quickly put together website flowcharts and site maps, plus one big example as a starting point.